For the vast majority of gamers, D&D is simply a fantasy game. The characters, the adventures, and the setting itself have fantastic elements that center around wizards, mages, and mythical creatures. In most cases, there are no aspects of science-fiction. We remain true to the core of what we read in the Lord of the Rings books and other popular stories and movies. A few settings, such as Eberron, describe a lost past where magic once duplicated what we think of as technology. Still, most of that has been lost and the majority of the game remains the same. When it comes to real science-fiction, experienced gamers often debate the merit of a classic adventure: Expedition to the Barrier Peaks. Despite being ranked the 5th-best adventure in issue 204 of Dungeon magazine, it gets picked on an awful lot. The reason? It has a spaceship. It has robots. It has aliens (at the very least, alien monsters). Many gamers may not know this was one of many crossovers in D&D, and not just April 2012’s issue of Dungeon and Dragon through DDI. The very first adventure ever written for the game was Temple of the Frog (which I blogged about here). Included within the Blackmoor supplement for Original Dungeons & Dragons (predating both AD&D and the Basic sets), this very first adventure by Dave Arneson is all about sci-fi mixing with fantasy. A big part of Blackmoor’s setting is the premise that an alien comes to Blackmoor and begins to change things. Power armor, satellites, special mechanized healing technology, it is all there. 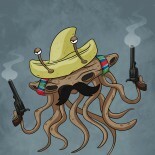 In fact, the actions you take could bring other aliens to Blackmoor! Let’s state this again: The first adventure ever published for any RPG was a sci-fi crossover! Blackmoor’s influence was profound. It is said in the excellent Designers & Dungeons that Gary Gygax at first really didn’t have a setting. He had a dungeon. Dave Arneson’s Blackmoor was really the first RPG setting. When competitors began to create settings, Greyhawk was expanded so as to be a true setting. Blackmoor was incorporated into Greyhawk as the Land of Black Ice, but became especially popular as part of the Mystara setting. Temple of the Frog was redone as one of the DA series of 4 modules for the Expert boxed set. Sci-fi elements were numerous. The crossovers didn’t stop there. TSR didn’t just print Chainmail. They also printed the minis game Warriors of Mars (1974), based on the Edgar Rice Burroughs “Barsoon” pulp sci-fi stories. Boot Hill (1975) was TSR’s (and the industry’s) second RPG and was a Western setting. 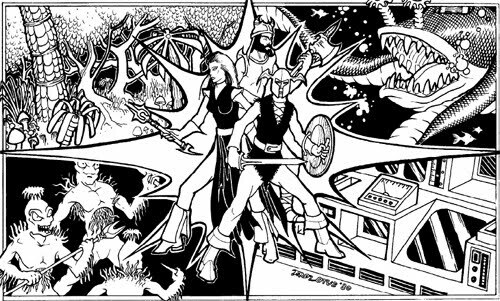 James Ward’s Metamorphosis: Alpha (1976) was TSR’s fourth RPG and was a true sci-fi game. Gamma World (1978) and second editions of Boot Hill and M:A were also accompanied by Top Secret (1980), Gangbusters (1982), Star Frontiers (1982), and more. This diversity was a key to TSR’s early success. We need only look to May of the Dead (where GoingLast easily gathered tons of horror submissions) for an example of how well horror has been integrated over time with fantasy in D&D. The same is not true of science-fiction. Gamers still resist mixing lasers and spells, even if Gary, Dave, and so many other famous gamers all agree it is worth doing. It was with all of that in mind that I wrote this blog entry recapping some of D&D’s history, just as it led me to pitch to Wizards of the Coast the task of writing about the vegepygmies, monsters first appearing in Expedition. While it isn’t absolutely clear, it is possible that the russet mold in the adventure is a form of the virus that doomed the spaceship and that the vegepygmies are a mutation of the original spaceship’s personnel. In writing the article I tried to speak to that possibility and link their reproductive cycles back to a shared DNA with the spaceship’s crew. I chose to draw upon all of these elements when writing Last Stand at Camp Starfall. It is supposed to be a campy horror adventure with strong pulpy sci-fi elements. The whole point is to have a blast (literally), laugh, die with a chainsaw sword in your hands, and enjoy the diversity that D&D has provided since its very humble beginnings. Download Last Stand at Camp Starfall here. This entry was posted on October 13, 2015 by Alphastream and tagged Basic, Blackmoor, Greyhawk, Horror, Mystara, OD&D, RPG History, Sci-Fi, Vegepygmies.